I haven't tried this yet, but at the cost of zero dollars it's worth looking into. I have a difficult enough time trying to learn Finale, so let me know what you think if you do get this program going. 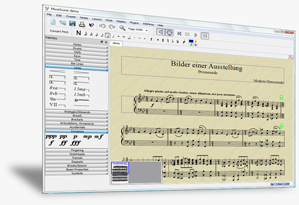 MuseScore is a free cross-platform WYSIWYG music notation program, that offers a cost-effective alternative to professional programs such as Sibelius and Finale. I used Finale and I felt the same about it; it seemed a little difficult to use it, then I switched to Sibelius! Man, it's great, a lot easier and very intuitive! Forget MuseScore, very limited and really not worth the effort. Stick with either Finale or Sibelius. Of course the other alternative is to work in Logic which has a pretty decent score system, not perfect but actually not bad. This way everything is in the same package! I think MuseScore is very good for a free program. As a Mac user, the centrality of the "right-click" to so many important tasks is one of the more annoying aspects (control-click is the Mac equivalent). You also need a full keyboard with a true "backspace" key (the "delete" key is more or less non-operational; not sure why this is). After getting used to these and a few other oddities, I've found the program to be very capable for "notes and rhythm" music. What's far too difficult is making drum parts with various combinations of slashes and other noteheads; if you do a lot of that, you'll probably find MuseScore very frustrating. Even so, it beats the hell out of the mid-90's programs that I got started composing with, and it's free. I've recommended it to many of my instrumental students, though I would probably steer a serious composition student elsewhere. Also, to my knowledge, MuseScore is not an "online based" program run in a browser, but rather an application that is downloaded/installed. I'm not sure you can rightly call MuseScore 'limited' when the IMSLP is using it to typeset a huge variety of scores, but I will say that it isn't the easiest thing to learn. Having only used Finale and MuseScore, I'd say that the overall winner for easy of just writing parts is Rosegarden although it is somewhat unfinished when you get into some of the finer points of scoring. Nonetheless, what Rosegarden has that none of the others seem to support is a musician's view of composing: you enter notes based on the do-re-mi of the key in which you are working, not some map of an organ keyboard on to the quertyuiop, a=Do, b=Re, shift is sharp, control shift is flat; for the sorts of diatonic musics I tend to need, this is just a much more natural way to use the keyboard and I find I can write a part out in minutes without having to ponder alphabet mappings.